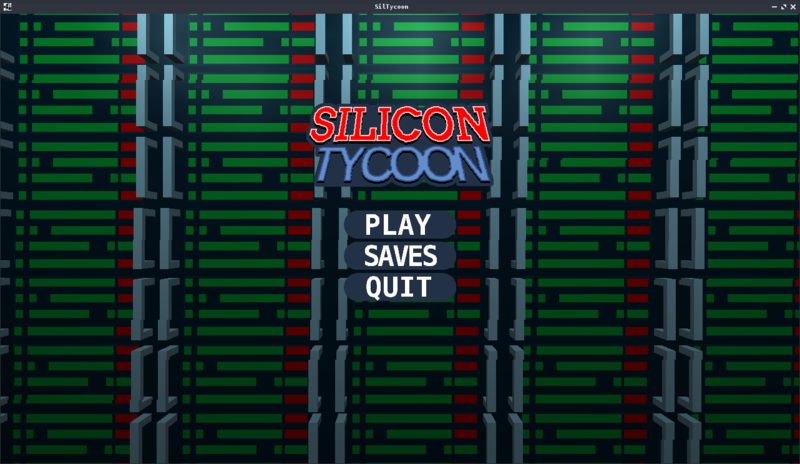 Silicon Tycoon is a game about Lying Stealing and Cheating to gain ahead of the competition! 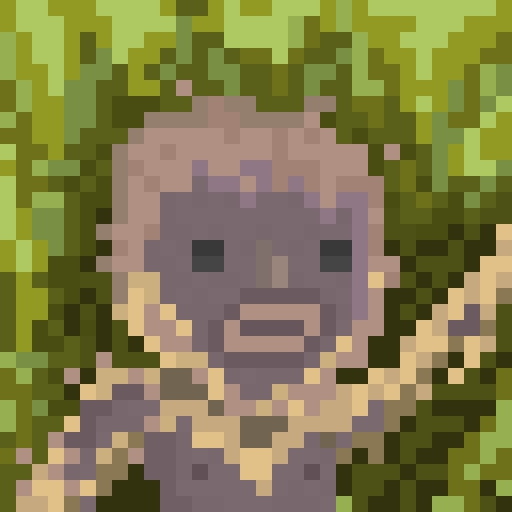 Currently it is in pre-alpha and much of the fundamental gameplay mechanics haven't been put in yet. Here are a few screenshots to keep track of where the game is. 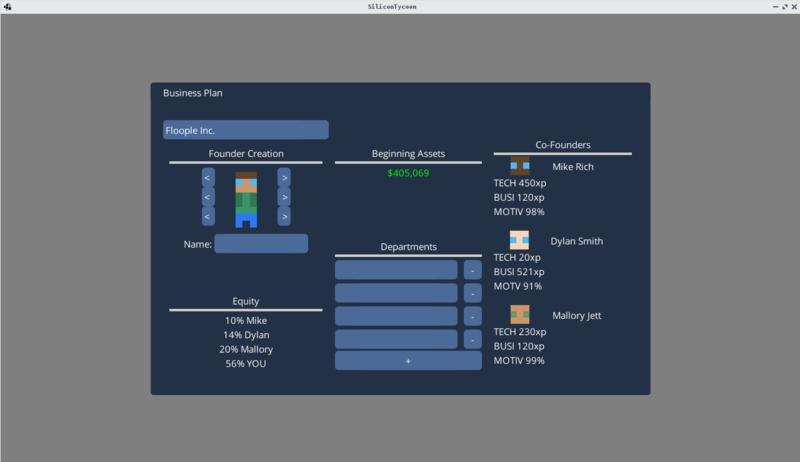 Here is the company creation screen. This is the main menu with 3D rackmount servers scrolling in the background. What will the game-play be like? This is kind-of a late reply, but it will be Civ-Esque with a rollercoaster tycoon vibe. 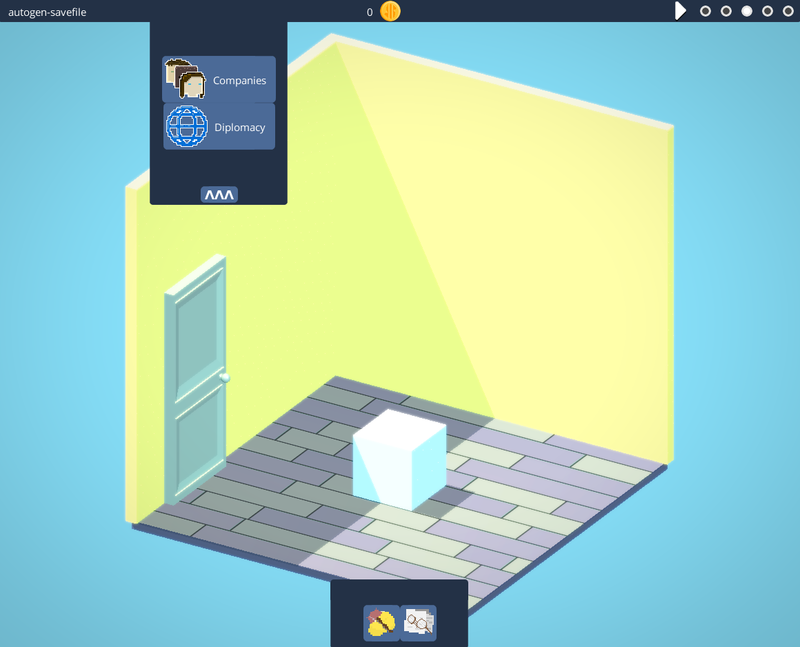 I've been working on the game recently, and I completely gutted the old 2D top-down code to introduce the new isometric 3D tile system! All the original GUI is the same, and the intended mechanics too. Currently the walls disappear when you move the camera. Dragging grabs the mouse. Whoohoo! It's been a while because I've been preoccupied with school, but I found the time to finish up what I've been working on for a while now. I started working on assets, and similar to most tycoon games, you must work up to different tiers. How It's broken down is that there are a list of Depots that sell different rooms, furniture, and decorations. The one's I started working on was the office depot "Stables Depot", and the house decor depot "The Home Depot". Here's an image of the two with there different tiers. Of course what's a company without employees! Companies will be organised through departments, each with their own list of employees and "missions"... I'll get more into that next post. Departments are entirely custom so you can structure your company however you'd like ( different combinations of skills working on different missions will increase your success ). Here's what the characters look like with their startup-swag! You begin the game with a starting seed funding of 6000$. You can choose between an empty apartment, office space, or full on building based on your difficulty setting. The gameplay would involve using your departments labour to power your products and services, the speed at which your company grows and makes money is dependent on your sales, competition, difficulty setting, and so forth. 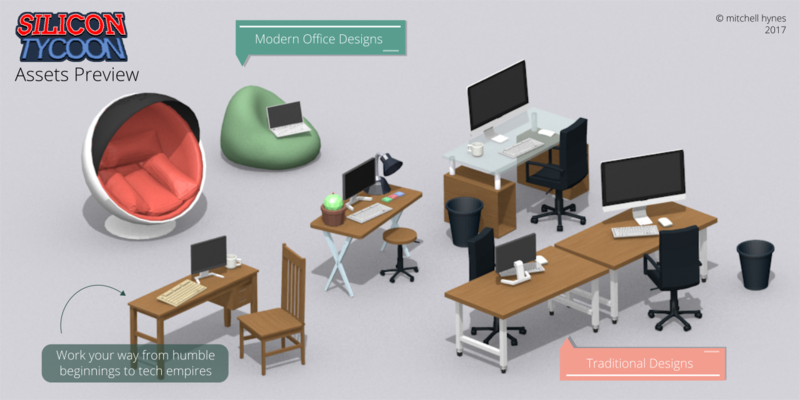 The real fun parts in the game will be the creation of products like games, art, or tools, also the decoration of your office and tweaking every square inch to make your employees as happy and efficient as possible. Thanks to TheAgentD I finally got the in-game graphics I was looking for including SSAO, and Hardware-PCF Shadow mapping. I'll edit this post in the morning and add a screenshot.